Shop OTC Professional Orthopaedic Elastic Posture Support, Beige (1 ea. )1 ea. 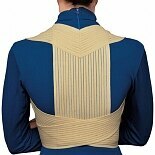 Ease tension in your shoulders and back with posture braces. These specific back braces are designed to hold your shoulders in their natural position to avoid slouching or poor posture. Available in multiple sizes, posture braces can be worn under your clothing for discreet support. Try a back brace for posture from OTC Professional Orthopaedic. In addition to posture suppor braces, we carry back and abdominal supports to help ease discomfort from injury, strain or surgery. Some lower back braces come with hot and cold systems to help sooth stiff backs. Additionally, there are lumbar cushions for use at work, home or in the car for lower back support while sitting. There are abdominal binders for men and women in a range of sizes to help secure post-surgical dressings or support weakened abdominal muscles. Industrial back belts are typically worn outside your clothes for safety while lifting or doing other strenuous activity. We carry other options to help relieve back pain and provide additional support. You may be able to reduce your discomfort by using orthotics. Orthotics for women and men are worn in your shoes and can offer needed relief. There are also systems for back pain relief that incorporate electronic pulses and heat therapy products to help alleviate stress and strains and relax muscles. You can also use ibuprofen, acetaminophen or back pain relief medicine.